Adventures in the Endless Pursuit of Entertainment: What divas? Hugh Jackman was in the house! What divas? Hugh Jackman was in the house! Der Rosenkavalier! 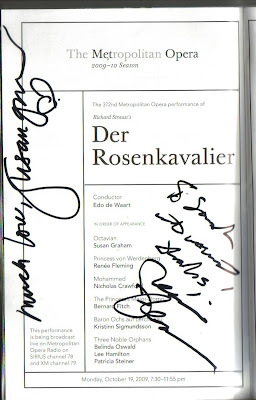 I've now seen Der Rosenkavalier four times - twice at the Met plus one dress rehearsal plus one at Chicago Lyric. This is one that I plan on seeing over and over again. It's a little like a romantic comedy chic flick, only much more beautiful because the music of Richard Strauss is no less than breathtaking. It's the story of teenage count Octavian (played here by divine mezzo soprano Susan Graham in a signature "pants role") who is in love with Princess Marie Therese (I'm certain that Renée Fleming was born to play this role of the Marschalin) at least twice his age. In Act I, after a night of blissful trysting, Octavian (dotingly called Quinquin and Marie Therese are basking in the early morning glow. Octavian is devoted to her and she's soaking it up. Unfortunately, they are interrupted and she bades Quinquin to hide as her oaf of a cousin Baron Ochs visits, seeking a favor. Octavian disguises himself as a chambermaid. Hilarity ensues as Ochs is unable to resist "her"(Susan Graham says, "I'm a girl playing a boy playing a girl - what a mess!"). To further muddle the mood, a horde of court attendants, including an Italian singer, her hairdresser and a dog barge in to the Marschalin's boudoir. The hearts and flowers of the love affair fade quickly as the Marschalin realizes that she's feeling her age and that Quinquin is undoubtedly going fall for some young thing. She sings the heartbreaking aria about the reality of the aging woman. Alas, she's right. Snag! Sophie and Quinquin instantly fall into young love and of course, Sophie is mortified by the Baron. Things drag on and the baron and his crew become more and more dispicable. Unable to stand that his newly beloved Sophie is betrothed to this boor, Quinquin fights him. He is sent on his way, but not before he devises a plan to reveal the low life that the Baron really is. In Act III, Quinquin's plan is executed - more hilarity! He's dressed like the chamber maid again and is ready to snare the baron. Voila, it works! Enter the Marschalin who advices the baron to hit the road with his dignity. Sophie is there too and Quinquin implores for her blessing, which she gives even though her heart has broken. The three sing a trio that is so beautiful it will slay you, and of course, it brings some to inevitable tears. We convened backstage to see La Diva Renée and Diva Suzi - and other lovely friends whom we've become acquainted with because of La Diva. And yes, we did see Hugh Jackman saunter by the green room. Apparently, it was his first trip to the Met and he did cause quite a stir. Even Susan Graham couldn't help but swoon. There is a book for children, entitled "The Dog Who Sang at the Opera", that divulges an anecdote of a dog who howled and barked during a soprano's (sic, Renee Fleming's) performance of an aria at the Met. If you are familiar with the episode I relate, do you think that this could have been the opera in which this occurred? Oh, how could you avoid falling in love with a man in a sparkly suit? That would be the end of me for sure. Hi Tyler, The Dog Who Sang Opera is based on a true story that to happened to La Diva Renee in Manon. It's a sweet book - the next time you're at Borders or Barnes & Noble, go to the children's department and read it. The Times news article and a letter to the owner of the dog "Pasha" are also included at the end of the book. My niece has the book and it's adorable.